You downsized to a smaller condo or apartment. You chose a classic, older home without many modern updates. Or, perhaps you’re adding a second functional kitchen in your home in order to create a rental or mother-in-law suite. Whatever the reason, you may find yourself in need of a dishwasher and no space for it. Never fear, you are not relegated to a lifetime of dish-pan hands! A drawer dishwasher may save the day! 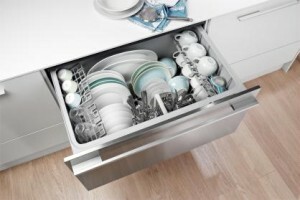 A double drawer style takes up about the same amount of room as a standard dishwasher. The drawers can be used separately or run at the same time. Talk about conserving water and energy! A single drawer is better for tight spaces; measuring about 24 inches wide and 24 inches deep, and between 16 and 17 inches high. A drawer dishwasher will keep dishes safe for housemates living with strict dietary restrictions such as a severe food allergy or kosher diet. A drawer dishwasher is an ideal solution when designing a kitchen for those with limited mobility or disabilities, as it doesn’t require bending over to remove or load dishes. A double drawer dishwasher will likely cost around $1,100 to $1,400; a single drawer, $700 to $1,000; but of course, prices may vary – so check out all of your options. Fisher & Paykel launched the style, and it was followed up in recent years by other major kitchen brands. The first generation KitchenAid dish drawers from a few years ago were licensed from Fisher & Paykel, but they no longer are. Kenmore and Maytag dish drawers are manufactured by Fulgor for Whirlpool, and not Fisher & Paykel. If you have a drawer dishwasher you love, let us know what kind you chose in the comments below!